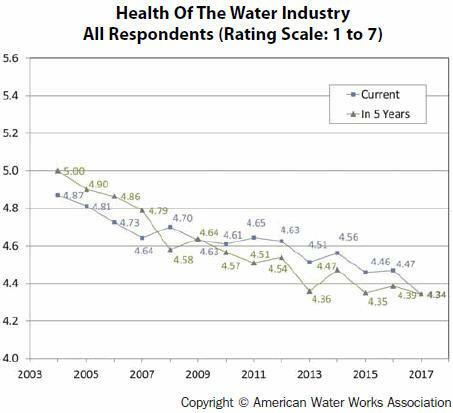 The American Water Works Association’s annual State of the Water Industry (SOTWI) study reveals declining confidence compared to recent years. So it is slightly concerning that in 2017, SOTWI respondents bucked the trend — and even their human predisposition — by viewing the water industry as pessimistically as ever. AWWA asked its members to rate the current health, or “soundness,” of the water industry on a scale of 1 to 7, and to project five years into the future. In both cases, the scores came in at all-time lows for the SOTWI study, first conducted in 2004. Current soundness had always been rated between 4.5 and 4.9, but dropped to 4.3 this year. Likewise, the five-year outlook had always ranged from 4.4 (the previous low, in 2016) to 5.0, yet was also rated 4.3 in 2017 (looking ahead to 2022). While this downtick does not signal an avalanche of pessimism, it does indicate a general and uncharacteristic erosion of confidence. So what is it that has these traditionally steady men and women of water concerned? The survey tells us that as well. The consistency of concerns above is not surprising as they have not been appropriately addressed since they came to be a problem. Why is this? Because of the incredible scope of rebuilding needed (see #1), costs can be prohibitive (see #2), especially when there is scant public and political will (see #4 and #5) to fund improvements. These factors, considered alongside the natural threat of climate change, coalesce to put water supplies that have long been taken for granted at risk (see #3). The shorter answer, however, is that it comes down to money. Any deferred maintenance for pipeline infrastructure will end up costing more in the long run, yet public money is often shifted from water and wastewater needs to pay for “showy” (i.e., above-ground) projects that elicit more immediate community gratification and, for politicians, votes. 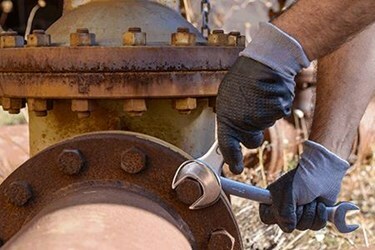 But pipeline breaks that cause service disruptions, property damage, and require emergency, around-the-clock repairs are much more expensive than planned, predictive, and preemptive maintenance, so it’s better to invest sooner rather than pay the ultimate price later. AWWA asked its members to rate the current health, or “soundness,” of the water industry … and to project five years into the future. In both cases, the scores came in at all-time lows. Shifting to what utilities have always done well, protecting the public, the survey asked what regulations are of greatest concern currently. The top three were: (1) point source pollution, (2) chemical spills, and (3) PFOA/PFOS, which are chemicals once used in commercial product manufacturing, firefighting foam, and industrial processes that persist regionally in groundwater. Looking into the future, the respondents cited three different areas of regulatory concern: (1) pharmaceuticals and hormones, (2) security and preparedness, which includes cyber- and physical security as well as emergency response, and (3) nonpoint source pollution. Whatever comes to pass, utilities have earned our trust in keeping the public safe and our water clean. However, they are being tested now more than ever and staring down the barrel at even greater challenges. Frankly, they are feeling the heat. What they need now, beyond the well-earned trust, is support from all whom they serve — that is everyone — so that they may continue to be models of consistency.